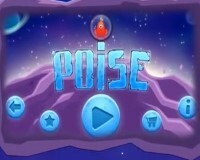 POiSE is an amazing arcade game that tells about the adventures of a funny alien named Spike! Spike’s ship was wrecked among the asteroid belt. He’ll have to struggle out of scope of the asteroid belt by the use of a special rescue capsule to reach the ship that come to the rescue. Each level is one of the asteroids, where Spike needs to balance a certain amount of time, waiting opportunity for jumping to the next level. At the moment, the asteroid belt has 30 celestial bodies(in full version) of various shapes and sizes. With Poise, fans of the mobile app will have the opportunity to enjoy the classic features of an arcade-style game, along with components of dodge and runner. “We’re extremely excited for the launch of Poise, because we feel it’s something that’s really going to speak not only to true mobile gamers, but even to the novice gamer looking for something that will hold their attention,” said Ivan Korobko, the independent developer heading up IK Studio. Throughout gameplay, aside from time limitations, it’s also necessary to maintain balance on rotating asteroids, while occasionally being obstructed by falling meteorites. There are three types of meteorites in the game, including rocky meteorites, icy meteorites and flaming meteorites. They each present different and unique trials to the player through the progression of the game. The ultimate goal of the game is to reach an emergency rescue ship, which will transport Spike from the wreckage.